Local bus Service 21 returns to Steer Park. From Sunday the 20th May 2012 Plymouth Citybus Service 21 will return to Steer Park. In March this service was withdrawn from Steer Park and terminated at the District Centre. However thanks to Driver and Customer feedback saying that the Service 21 would still reach Steer Park on the same end to end times, from this Sunday the Service will return. There will be some minor time changes between some stops along the route, but there are no changes to the number of journeys or to the frequency. 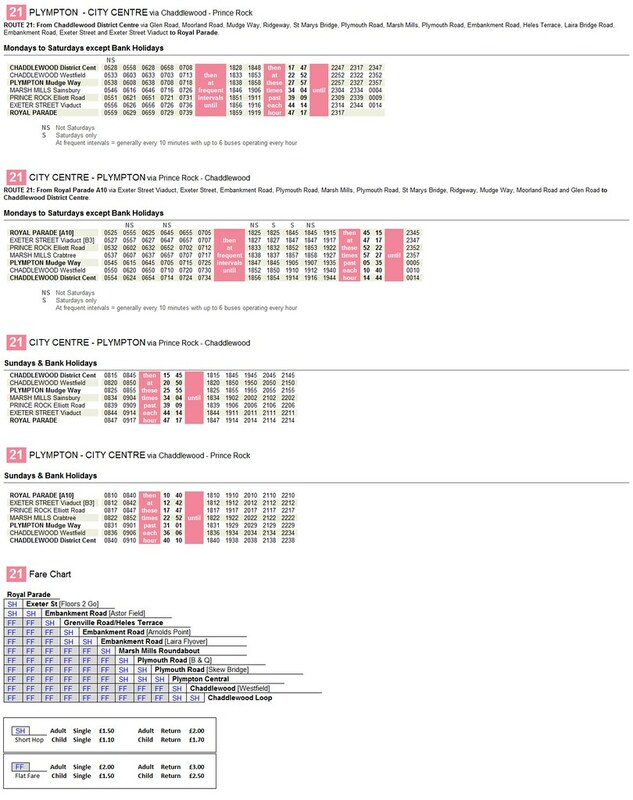 The other thing worth mentioning is that Citybus have now tidied up their timetables on the internet and present a much more professional and consistent look across all their routes. On a less positive note it seems they no longer have current and upcoming timetables on the site and the timetables are not dated at all. Normally this wouldn't be a problem but as I type this up the timetable for the 21 is as below with no mention of Steer Park yet. I am sure the new times will be there shortly. Top marks for having the fare chart on each timetable now!